Let’s take the C major 7th chord I talked about in the last post. …start moving the notes around. In some cases when you do this, you get other functional chords (rather than ambiguous ones). For example, move the 7th of the chord (the note on the E string) down a semitone and you get a C dominant 7 chord. Move it another semitone down and you get an A minor 7 chord. Suddenly, we’ve changed roots from C to A. Now, using the A minor 7 chord, move the note on the G string up a semi-tone and you get an A dominant 7. Move that same note up another semitone and you get an Asus4 chord. So the work is to simply move your fingers one or two frets up or down on each string, just like you did with triads. The difference is that with 7th chords, you get more material. The guitar is all about patterns; chords are the most obvious example of this. Triads are three-note patterns; 7th chords are four-note patterns. If you’re into permutation, you’ll know that there are a lot more four-note patterns. …and take the first, the third, and the fifth note (C, E, and G ) of the scale to form a C major chord. Add the seventh (B) and you have a C major7 chord. Here’s where knowing the names of the notes on the neck of the guitar helps. If you don’t know them, what I’m about to talk about will hopefully motivate you to learn them. Knowledge equals power. Take the notes of the C major7 chord: C E G B. Now let’s see how many shapes those notes make on the neck of the guitar. I’m going to randomly choose the high E string to place my first note. And I’m going to randomly choose the 7th of the chord (B) to place on that string. The most obvious placement is on the 7th fret. The only other location for that note on the E string is the 19th fret…don’t bother. It’s kind of like a puzzle. You have one note. You need to find the others. We’’ll make it simple(r) and use adjacent strings – E, B, G, and D. We have the B on the E string; we need the C, E, or G on the B string. Once we have the note for the B string, we’ll move on to the other strings. What’s possible? 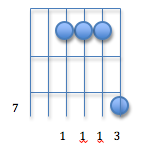 The C on the B string is on fret 1 or fret 13. Can you reach either of them while holding down the B? For most people it’s not practical unless you have hands the size of a gorilla’s. How about the G? No problem. It’s on fret 8 of the B string. And the E is on the 5th fret, so two choices. I’m going to randomly choose the E.
So now you’re holding down the B and the E. You need a C or a G to place on the G string. Then go back and use this process to build a new chord by keeping the B on the E string, and choosing the G (fret 8) on the B string. Then put the C and the E on the remaining strings. Continue to build new chords. Instead of using the B on the E string, use the C, the E, or the G. Then find the remaining notes on the other strings. Use only adjacent strings like we’ve been doing. As it turns out, the chord I built above is a common major 7th chord that you could find on any chord chart. Probably because it’s ridiculously hard to grab in the middle of a progression, and only sounds good in particular situations. The point here is to use your knowledge of the neck of the guitar to build stuff you wouldn’t be able to otherwise. Some of the things you find will be gold. Some things will need to be explored in different ways (strumming, arpeggiating, etc.) before you figure out how they can be useful. Some things will never be useful. Now build chords starting on the second note of the scale. That’ll give you D, F, A, and C: a D minor 7 chord. If it seems like there’s an overwhelming amount to do, that’s because there is. Just keep your eye on what you’re doing in the moment and after awhile, you’ll have a ton of material you can use to make stuff you never would have been able to. Ambiguous triads sound interesting because their quality (major, minor, etc.) isn’t obvious. Open chords, which I talked about in earlier posts, fall into this category. In these cases C/E is a major third and C/Eb is a minor third (In case you’re not familiar with intervals: count from the first note (C) to the second note (E) – C, D, E – and the number of notes names the interval). In ambiguous triads there’s no major or minor third above the root. This can lead to interesting sounds. A good way to work with this idea is to use scale-tone triads. Here are my posts on that. …and find the third. For this triad, it’s on the G string. Remember, this is the note you need to change for another. To do that, all you have to do is move the third either higher or lower. Try moving the note as far up or down the string as you can. Do the same with the minor shape. The third is on the G string in this chord, too. As you work with this, you’ll notice that the new chord shapes are the same for both major and minor triads. This speaks to the ambiguous nature of these chords. When you get rid of the third of a chord, the chord could be either major or minor. Or neither. If you want different chord shapes, you can move the other two notes in the triad around, too. This is a nice way of exploring new sounds. Here’s a link to major and minor triads on all string sets. Diminished, augmented, and suspended triads are on this chart, too, if you want to play around with those.